Belize has successfully completed its third Trade Policy Review (TPR), at the World Trade Organization (WTO) Secretariat in Geneva, Switzerland, from the 24th – 26th April 2017. The Belize delegation was led by H.E Ambassador Dylan Vernon, Embassy of Belize in Brussels and included Mr. Andy Sutherland, Acting Director General for Foreign Trade, Mr. Richard E. Reid, Senior Trade Economist and Mr. Terrence Simfukwe, National Trade Advisor. The Trade Policy Review is a requirement under the WTO Agreement through the Trade Policy Review Mechanism (TPRM) which seeks to analyse the trade policies and practices of WTO members and its impact on the functioning of the multilateral trading system. The TPRM is basically a periodic transparency exercise through which the WTO evaluates adherence by its members to the multilateral rules of trade adopted under the WTO Agreement which was signed in 1994 and entered into force on 1st January 1995. Belize is a founding member of the WTO and has already undergone two previous reviews, one in 2004 and the other in 2010. The TPR included two country visits by the WTO Trade Policy Review Division to Belize for consultative meetings with national authorities, based on which a Report was prepared by the WTO Secretariat and supplemented by another Report prepared by the Government of Belize. Both Reports were circulated to all WTO members who had the right to pose questions directly to Belize. Responses to questions were prepared and submitted to the WTO. The process concluded with this two-day meeting at the WTO Secretariat in Geneva where Belize had the opportunity to respond to questions from members in attendance. The meeting included Belize’s major trading partners, such as the European Union (still representing the United Kingdom), the United States, Mexico and Guatemala. The review panel included the Chairperson, Ms. Irene Young, Hong Kong’s Permanent Representative to the WTO, the Discussant, Ambassador Mr. Peter Matt, from Liechtenstein, and Mr. Willy Alfaro, Director of the WTO’s Trade Policy Review Division. In his opening remarks, Ambassador Vernon emphasized the substantial progress made by Belize towards implementation of WTO obligations, capacity development, and most notably in International Trade Policy. He indicated that despite the challenges experienced over the last two years due to decreases in Shrimp, Citrus and Banana production because of disease and financial difficulties, these industries are on the rebound. He noted that despite oil production plummeting to almost zero, the significant pressures posed by de-risking on Correspondent Banking relationships, all compounded by the damages from Hurricane Earl (2016), Belize’s Services Sector remains robust, contributing to more than 60% of GDP with the Tourism Industry contributing as much as 39%. The Belize Delegation worked assiduously to provide comprehensive responses to numerous questions and requests for clarifications from fellow WTO members prior to the meeting in Geneva, and this reduced the number of issues and concerns raised at the meeting. In his closing remarks, Ambassador Vernon assured Members that Belize will continue with the Economic Reform Process that is currently underway. These reforms include the Modernization of the Legal and Institutional Framework in various Sectors of Governance and cited examples such as the initiative being undertaken by the Central Bank to modernize the National Payment System, most notably the implementation of an Automated Payment and Securities Settlement System which interconnects Domestic Financial Institutions to facilitate large and small value payments, and the ongoing work toward the establishment of a National Credit Bureau System that will allow for greater efficiency in the distribution of credit in the Domestic Market. Ambassador Vernon reiterated the fact that Belize is fully compliant with its external debt obligations and that will strengthen its Trade and Investment Regime. 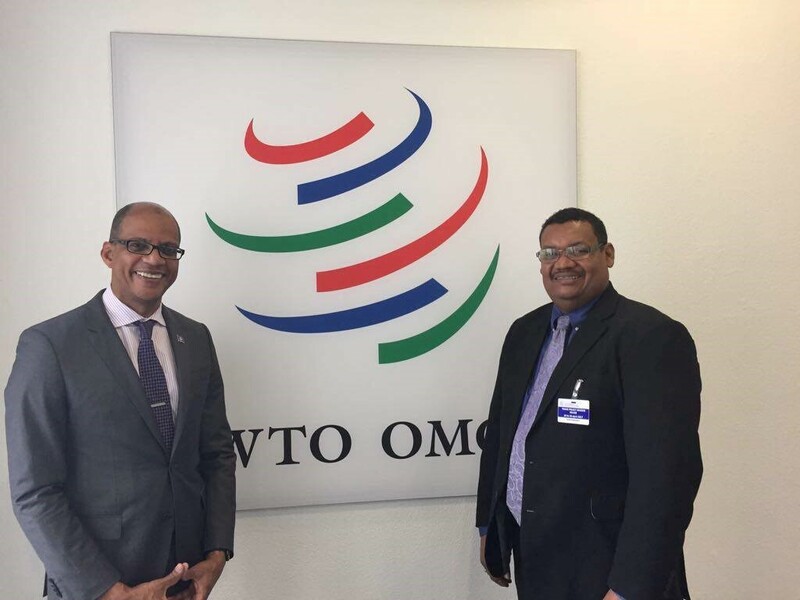 Belize is currently exploring possibilities for a Mission in Geneva to ensure adequate participation in the WTO process and to improve linkages and networking with the WTO Secretariat and with other WTO members. Ambassador Vernon also stated that Trade Facilitation is one of the key pillars in Belize’s Trade Policy Framework and as such Belize is working towards effective implementation of the WTO’s Trade Facilitation Agreement, which will significantly contribute to improving Belize’s “ease of doing business” ranking in the various indices for Trade Facilitation. Belize reiterated its commitment to Policy Reforms and action in the Tourism Sector as provided for in the National Sustainable Tourism Master Plan. The Ambassador noted that to address security concerns Belize’s Growth and Sustainable Development Strategy clearly identifies Improvement of Governance and Citizen Security as a critical success factor. This, combined with the new National Security and Defence Strategy, sets out a vision for 2020 that will address social issues which fuel crime and will ensure the protection and integrity of our national borders. Ambassador Vernon mentioned to the meeting that Belize is working to diversify its economy away from its current over-dependence on the Agricultural Sector; this will be achieved through a sustainable balance between Domestic and Foreign Direct Investment, in line with the National Export Strategy and the Growth and Sustainable Development Strategy. Belize concluded its presentations successfully and was commended for the progress made and the Economic Growth achieved since the last Trade Policy Review in 2010. Ambassador Vernon emphasized Belize’s intention to pursue its Trade Policy Development, and to comprehensively address the shortcomings identified, in the period ahead. Belize’s fourth Trade Policy Review will be due in 2024; seven years from now and the Directorate General for Foreign Trade will continue to lead implementation of Belize’s WTO commitments and the formulation of the National Trade Policy.